When Robert and Annette Becker bought their pleasant little bungalow on a quiet street in Salt Lake City, Utah, they knew one of the first things they wanted to do was re-landscape. 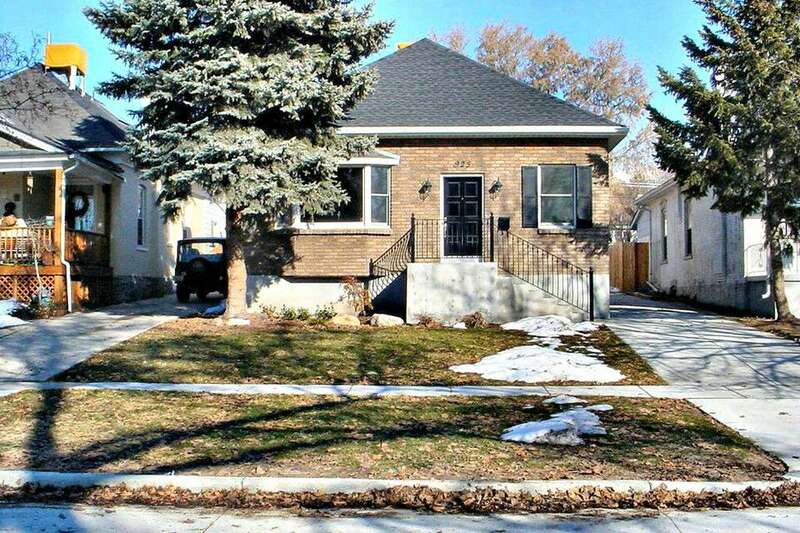 Not that there was much there to begin with, other than a 70-foot-tall spruce tree with roots encroaching the yard and house, along with a dying lawn. The Beckers, who are both engineers, say they are not gardeners but appreciate coming home to an appealing space and spending time outdoors. "Our main goals were to limit water consumption, create green spaces between the houses, have a comfortable patio in the back to relax, and an attractive green space from the street view," says Robert. The couple also wanted to get rid of the existing planting beds because they did not fit the small yard and lacked any sort of plan or design. Another goal was to minimize the old hardscape and soften the front and back yards, since the homes on the street are so close together. Their landscaping and plants focused on a variety that would create interest throughout the four seasons. 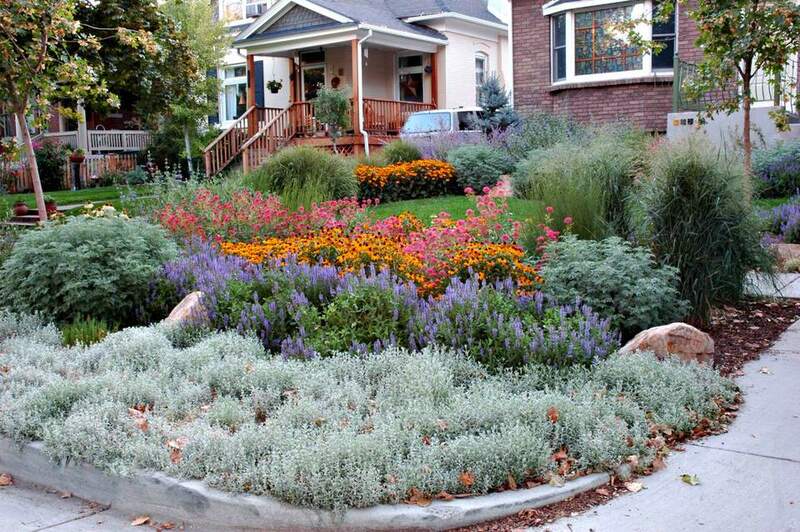 The Beckers were attracted to landscape designer Richard Laughlin's passion for sustainability and the environment, along with his notoriety in the Salt Lake City area for creating beautiful gardens using native, water-wise plants. "We wanted to minimize water use and found that Rick had expertise and experience with water wise yards," says Robert. "Rich was very open and solicited our main priorities. He asked lots of indirect questions about what we liked and didn't beyond just plants. He got a clear direction of the main concepts of how we would use the space." Both the Beckers feel the landscape designer was easy to work with from the initial concept to the final design. "With the small space we worked back and forth on many details. Rick provided a great perspective of space and helped us be comfortable with final decisions as we worked through the details," says Robert. The long, narrow driveway went from the street all the way to the back of the property, where this tiny, one-car garage was the final destination. The driveway took up most of the space that could be used for yard, and who needs such a long driveway, anyway? Before landscaping began, the Beckers built a two-car garage behind the house and tore down the former one, gaining more space in the yard. After the garage was torn down and a new one located behind the house, it cleared away more space for the actual yard. One of the first things to do was use jackhammers to bust up old concrete, then till the soil to get ready for planning and design spaces within the yard. Since the Beckers wanted a front yard with just plants, everything was dug up, including the old, deeply rooted spruce that had been in the yard for about 75 years. Part of the front landscape included the 18-foot-wide park strip--that area between the curb and the sidewalk. While it is owned by the city, property owners are required to maintain the strip. Not all cities have the same rules and laws, and landscape designers must be familiar with them. Drip irrigation was installed before amending the soil. Richard has been using drip lines for nearly 30 years in his practice, with what he feels are good results. "It targets and waters the root zone of a plant," he explains. Systems he recommends include Rainbird, Hunter, and Dripline. Using amendments is a must, since soil in the intermountain west is mostly clay, says Richard. The backyard had to be created in levels, which presented some challenges. Using wheelbarrows for mixing, the crew shovels and lays concrete for the patio foundation. Basically, there were two main level changes. A diagonal path begins one of the levels. A 6-inch base was laid, and then it took a few days to lay the patio. The workers lay out the curving edging and concrete blocks where the lawn and a planting bed will go. After the patio was laid, posts were built to support the pergola. Once the posts were installed in concrete, the wood pergola was built. A bionative lawn was planted in the front yard, which Richard describes as a variety of drought tolerant grasses mixed together. "You can't tell the difference visually, but you sure can tell the difference on your water bill," he says. "Once it's been established, this grass requires about 35 percent less water than traditional bluegrass lawns." The Beckers' dogs have a patch of lawn upon which to play and do other things. A metal gate was installed where the one-car garage once stood. Even an attractive hideaway was built to conceal the trash containers. Now, the homeowners enter the alley behind the house to access the new two-car garage, which has a door that opens to the inviting backyard. After a couple of years, shrubs, perennials, and other ornamental grasses and plants filled in to create a lush landscape. "Once you get to the point where there is almost plant-to-plant coverage, weeding and maintenance go down to almost nothing," says Richard. "The density cuts down on light, which is what allows the weeds to grow and become a maintenance nightmare." With the new landscaping and irrigation, water use was cut down immediately, says Robert. "We have also really enjoyed the park-strip combination of plants and rocks and the maples as they've grown in." The Beckers chose maples for the park strip, along with a native tree that won't grow too large. "We really deferred plant selection to Rick and based on his initial input researched individual plants and worked on alternates if we didn't favor his initial selection." The Beckers cite the back patio and pergola as a favorite feature, especially with its climbing roses. The new flagstone path is placed diagonally as it gradually climbs uphill. This is where the driveway used to be. Native plants soften the path. This former concrete driveway was transformed into a lush, water-wise colorful collection of perennials and vines. The pergola with trumpet vine trellised over it provides shade during the hotter months. Plants chosen for the pergola include Nepota (a type of catmint) and Zosnaria. The backyard turned into a peaceful space with lush plants and something always in bloom. Richard is among a growing movement that advise against using wood mulch in a garden. It offers little protection against weeds, he maintains, adding: "It doesn't have any beneficial effects to the soil, doesn't leach any beneficial nutrients, and it is not as visually attractive as mulch leaves, pine needles, or gravel. Or even grass clippings. Plus, once they reach plant-to-plant coverage, you don't need mulch." The ski lift chair was one of the original chairs from the Sugarloaf lift at Alta and is an original Yan cast aluminum chair. "When Alta upgraded the lift and replaced the chairs one of the maintenance staff bought them and converted them to benches or swings, says Robert, "People love it because many of us are skiers and it is a very comfortable seat." Not surprisingly, he and Annette are both outdoor lovers, and enjoy skiing at many of the local mountains in Utah. More flowers and native plants show off during peak growing season, proving that water-wise doesn't have to be just bare dirt, rocks, succulents, and dry-looking plants. Flowers were planted with their ultimate growth heights in mind, starting with the shorter ones in front, working to the larger specimens in back. The Beckers are thrilled with the results. "​ We both love the balance of living in Salt Lake City as a smaller city and having access to the outdoors. Annette has two labs that she dovotes much time to and we both bike and ski frequently." The front yard designed for the Beckers is now a traffic-stopping, lush collection of drought tolerant perennials and ornamental grasses. Naturally, the lawn is water-wise also. A small 'Baby Blue Eyes' spruce tree in the back by the northwest corner of the house is where the larger one once stood. After the project was finished, "We got lots of positive response from neighbors, as it fits in well and looks spectacular year round," says Robert. "Rick's design really worked for the four seasons creating something of interest and a different focal point spring through fall. As the yard filled in after the first few years it became a perfect space to relax and enjoy."